On the first Sunday evening of each month hosts PAUL KEMP on keyboard and vocalist MACHIKO SHIMADA invite a special musician or two to play with them while guests are enjoying a delicious Sunday supper. The show is inside in cool weather and out on the Hotel veranda during the summer. Music runs from 6:00 to 8:00 but the 7:00 to 8:00 segment is recorded and re-broadcast the following Monday evening at 8 PM on “TheTee” 99.5 FM (streaming at KNTI.com) and the following Saturday at 7 PM on Lake County Public Radio KPFZ 88.1 FM. 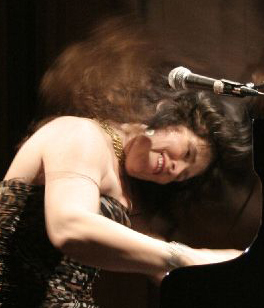 The guest artist for this evening is the energetic “Queen of Boogie Woogie,” Wendy DeWitt, with Kirk Harwood on percussion.